UPDATE! – Case closed! Game confirmed as released and preserved by Marco (Exile) Das and Genesis Project. See downloads. Early days, hence a very short entry. 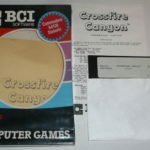 Contributor Jari Karjalainen has reported that in a DigitPress interview with Robert Jaeger (creator of Montezuma’s Revenge), he mentioned a game called Crossfire Canyon. 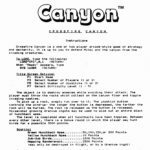 Originally this was made by his friend Dave Sullivan and he was to convert it to the C64. Unfortunately neither version has been found, so does it exist? Can anyone help otherwise preserve it? 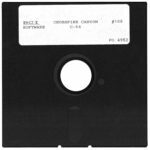 It seems that the game could be preserved at the “Stephen M. Cabrinety Collection in the History of Microcomputing at the Online Archive of California”. We’ll see how this goes. 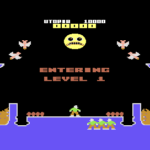 The game itself was a port of a title from the Vic-20, written by Dave Sullivan. 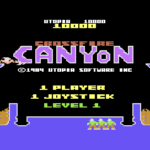 It was simple and fun, where you would control a guy trapped on a platform on the bottom of a canyon. There were two volcanoes that showered a stream of rocks on the left and right sides. You could only run left and right and pick up rocks and debris that lands on the floor. 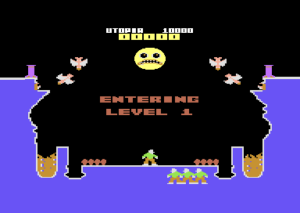 Enemy creatures would emerge from caves on the left and right side – these would arrange in stacks and push rocks at the player. At the time, Robert suggests it was criticized for being too simplistic and as a result was never released. It is possible that Robert has it still somewhere, but may not wish to release the game. 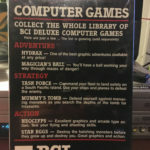 But recently in 2017, contributor Mark Sawtelle came forward with a sealed copy of the game, which was released by BCI software. We are not 100% certain if it is the exact same game, but hope to find out soon. It’s likely the game may be sold at auction in the future, so chances of seeing it preserved may still be slim. But it seems the game could well be out there! Interview excerpt from Digit Press …. Full interview can be found here. It was criticized by everyone for being too simplistic for its time. I still love very simple games. I don’t know where it is, but will probably come across it some time. Since it wasn’t my original game, I would not want to release it. 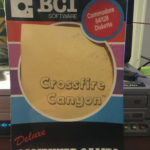 I bought the game from Mark Sawtelle and i can confirme that the games is indeed Crossfire Canyon from Utopia Software released by BCI software in 1984. Will send more info’s soon. Have you buggered your home page? Going to https://www.gamesthatwerent.com/gtw64/ brings up this entry instead of the index. I did! Thanks Hank! Accidentally broke it when fixing the page path!